The Nokia Lumia 520 is one of the more popular Windows Phone handsets, which is interesting because the hardware specifications of the device are not exactly “high-end”. Part of the appeal is the affordable price, and it comes with decent specs for that price. So it is a good value. Back in November, the Lumia 520 dominated the Windows Phone market with a 26.5% market share. But that was then and this is now. We’re in February of 2014, so is the Lumia 520 still dominating? By now other Windows Phone handsets must have managed to steal back some market share. Not really. Recent figures released by advertising provider, AdDuplex show that the Lumia 520’s market share has actually grown. 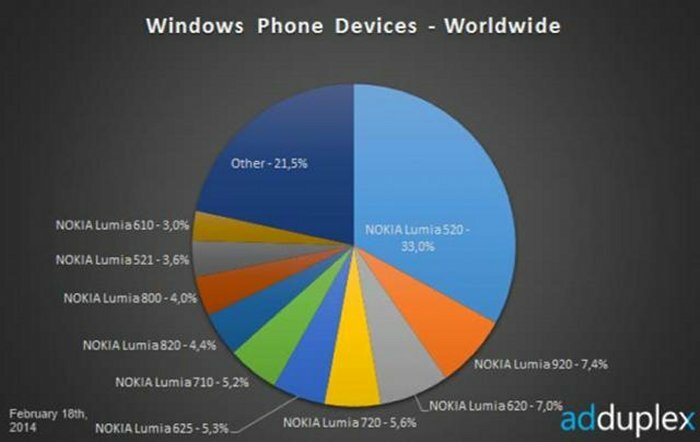 In November of 2013, the Lumia 520 had a market share of 26.5%, but with February’s figures, it shows that in the past few months, that market share has increased and the Lumia 520 now accounts for 33% of the Windows Phone market share. If you combine that with the Lumia 521 (T-Mobile’s version of the Lumia 520), it would mean that its market share is at 36.6%! That’s very impressive and we didn’t see that one coming. It will be interesting to see where it goes from here.